Breathe a breath of fresh air while exploring Saugus property on horseback. Saddle up and get to exploring the lay of the land at Don E. Brook Farms. Trail rides expertly match horse to rider. Friendly mounts aim to please and are playful yet sure and steady. Trail hands lead the way along paths winding through pleasantly picturesque scenery. Hour long rides satisfy the novice and find many yearning for longer excursions. When love is in the air sunset dinner rides are just the ticket. Horse and rider teams meander along the route as the sun sets prettily. Making the way back to the farmstead the evening meal is served. Catered meals coupled with a campfire create an intimate and magical vibe perfect for romantic moments. Besides trail rides Don E. Brook Farms serves all the equestrian needs of the Saugus real estate area from simple jaunts on the trails to riding instruction and boarding. Lessons are available daily on the Saugus property. Professional teachers work with all levels of students, youth and adults. Group lessons vary between English, Western and Flat. Other classes feature Barrel Racing and Gymkhana. 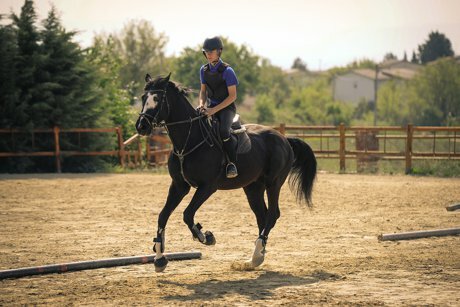 Jumping lessons are quite popular with Saugus property equestrians. Walk ins are always welcome to saddle up and join in anytime. More information about lessons can be found here. Creativity is in the works on this piece of Saugus real estate. Parties are often held at the farm and the birthday boy or girl the envy of all invited. In the Rodeo Wrangler Party young cowfolk maneuver the ropes and learn to throw a lasso. Get girly with glitter with the Unicorn Magic Party. City Slickers features campfire dining and leisurely rides. Located at 28680 San Francisquito Canyon Road this is the place to go to horse around. A long history spans over five decades. The folks here know what they are about and they take pride in high quality beloved horses and their dedicated team of workers.